Did Huawei just blow Samsung out of the water with the MWC 2019 announcement of the world's first out-folding smartphone? Perhaps, but the largest mobile device vendor out there is certainly not going down without a fight, trying to fend off the incredibly ambitious Mate X with a Galaxy Fold price tag that's actually starting to sound reasonable and a design that seems like a much safer bet as far as mass production and long-term endurance are concerned. 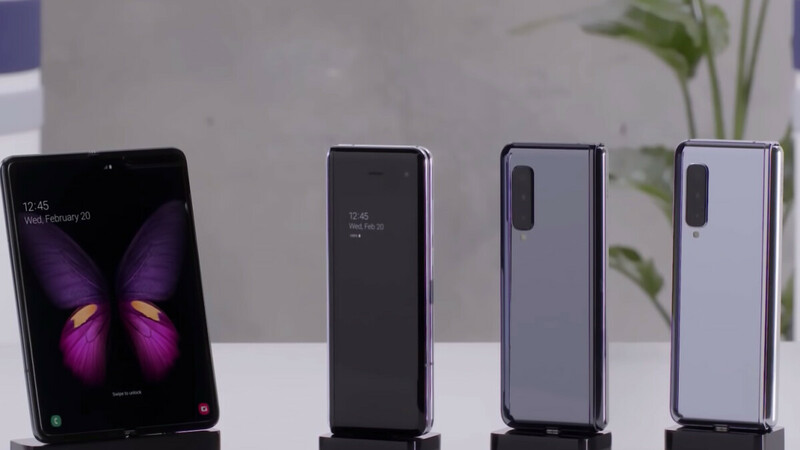 Don't get us wrong, the Samsung Galaxy Fold is also an absolute knockout, as proven by a 4-minute new video which just so happened to be uploaded to one of the company's official YouTube accounts on the day of the Huawei Mate X launch. The clip, which showcases various unique features and real-world use cases highlighting once and for all that the foldable form factor is not a gimmick, lacks any sort of a soundtrack. There's no music, no sound effects, and no narrator to walk us through everything the Galaxy Fold does and everything it can do. That's a pretty bizarre call on Samsung's part, but one could argue the product needs no introduction, explanation, or further hyping. The images speak for themselves, flaunting the futuristic design from different angles and in different folding states for about a minute. Then, the Galaxy Fold is shown wirelessly charging the Galaxy Watch Active, as well as the Galaxy Buds, which would be truly impressive if you could actually use either device while that process takes place. Next up, we get to see the phone folding and unfolding several times, demonstrating how smooth one can make the switch from a 4.6 to a 7.3-inch screen and vice versa. The easily pocketable and (presumably) lightweight device is shown in different eye-catching colors, but undoubtedly the most interesting part of the video comes around the 2:05 mark. That's when the Galaxy Fold starts to shine, seamlessly switching from a small to a large-screen Google Maps environment, taking and editing photos both folded and unfolded (again, with minimal lag), gaming like crazy, and just all-around opening a new world of possibilities for everything from video calling to social networking to Netflix and chilling. This is still a controlled demo, not to mention a heavily edited one that could cleverly hide the software kinks of a pioneering product, but the ball remains in Huawei's court to prove the Mate X can run just as smooth in just as many situations. Now this looks useable and practical. Compared to the TV remote Huawei is making. Still in shock how many fanboys Huawei has trying to down play Samsung although the fold is cheaper. It just looks so much more polished and an engineering marvel. The way the hinge and sides open up is exquisite. I'd totally buy this if it were a bit cheaper, You know, Not in the 2k range. If they manage to bring it down to under $1500 then maybe I'll reconsider. It looks great, but the massive bezels on the front and the thickness when it’s closed makes it an easy pass for now. I’d imagine by gen 4, this phone will be both near bezel-less and thin. It would be interesting to see if the Fold becomes a trend and eventually kills off small tablets. Exactly! Wayyy to bulky for me. Wait till iPhone comes out with a real version in two years that is refined. God I really want this! I bet you Apple may benefit from that screen, or maybe they get theirs from LG.